The game can be played with either 2 or 4 players. A line must be set up as the foul line and each player must stand behind this line to throw the darts. Each team has 3 magnetic darts to throw. The player must not pass the foul line or the player's throw throw does not count and the bag is removed. Each team alternates shots beginning with the team that scored the last point. The point values are marked on the target. the magnetic darts will "stand" on the target when they touch together. Different than other bean toss game, the sound "peng peng" when the darts hit the target is somehow like the drum sound. Good to play anywhere at anytime, especially the beach, backyard, BBQ, and even indoor. 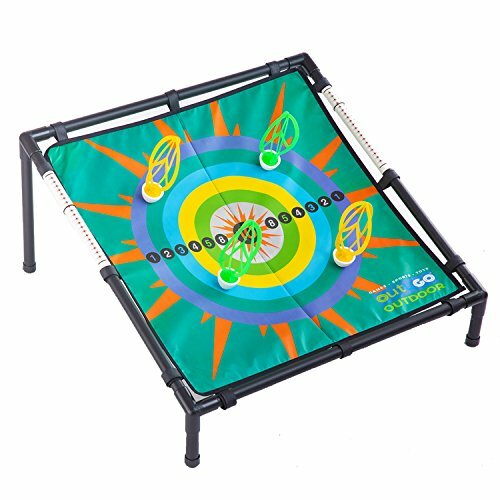 Click the Add to Cart button today and get the Magnetic Target Toss! Perfect Outdoor Backyard Lawn Game Tailgate Set - Great for Beach, Backyard BBQ and Indoor Use.